Batman: The Animated Series remains one of the best incarnations of Batman and his universe ever put on TV or film. With Warner Bros Home Entertainment finally releasing their deluxe Blu-ray box set there is renewed interest in the series, and rightfully so. During this year’s New York Comic-Con the folks at ComingSoon.net had the opportunity to interview most of the original cast and ask what their favorite episodes were. Anyone who watched the show has their own favorite (The Laughing Fish for me), but it’s fascinating to see which ones resonated with the case. 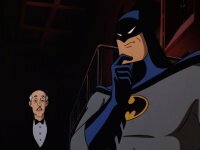 With a rich 85 episodes to choose from, it was a fun walk down Batman memory lane remembering each one that stood out to the cast. If you can remember the title, what was your favorite episode and why? If you can’t detail the plot for us in the comments and we’ll try to help find the title.